Steal one at any time, or spend a ton of in-game cash? Hmm. Everyone's flown the Lazer jet in GTA V. It's the one you can steal from Fort Zancudo, in both singleplayer and GTA Online. In my experience, the fastest way to do it in story mode is to have a taxi driver take you there, nick the cab then speed through the barrier to the first available hangar, then hope you don't get shot down as you escape inside one. I've done this hundreds of times now. It's the best fun there is. The Lazer is a decent enough if flimsy military aircraft, then. But I wouldn't pay 6.5 million GTA dollars for it. Today, though, if you log in to Warstock in GTA Online, you can. The price is a bit baffling—it's significantly more expensive than the similarly-powered Hydra at $3 million, and pricier than a lot of the other cool, customisable aircraft added as part of the Smuggler's Run expansion. More than that, though, if you own a hangar in Fort Zancudo, you can steal one at any time for free, and without being shot down by AA fire. So owning one doesn't really make any sense to me, unless you just need to have everything in GTA. As highlighted by the GTA Online subreddit, the description for the Lazer on Warstock is amusingly meta. Not amusing enough to spend that much in-game cash, but hey. "Who doesn't remember their first time? 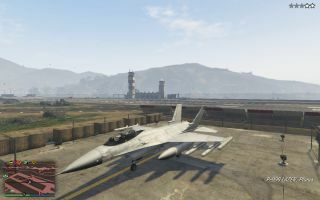 It seems just like yesterday: stealing a delicate hypercar, hitting the freeway going north, taking the dirt ramp with enough speed to somersault 200ft over the rear fence of Fort Zancudo, dodging the small arms fire, stealing a P-996, getting a 120mm shell inserted firmly up your intake, and enjoying the ringside seat at the fireworks. But now you're older and wider, you're ready for a tactical fighter to call your own. Time to come of age." To buy the Lazer with Shark Cards would cost a large fraction of the £65/$100 Megaladon card, which gives you GTA$8 million. I imagine this is one for completionists only.